Join Bicycle Indiana, Kosciusko County Velo Cycling Club, and the Ride+Walk Warsaw+Winona Lake initiative in adding more bicycle friendly businesses and Universities. You won’t be disappointed in the benefits it provides. We are proud of our friends at DePuy Synthes who already have the Bicycle Friendly Business designation. More are in the process of completing their applications. If your workplace has not begun the process, encourage them to participate or better yet, take the lead. Find more information, including the application at bikeleague.org/bfa, and let us know how we can help you with the process. 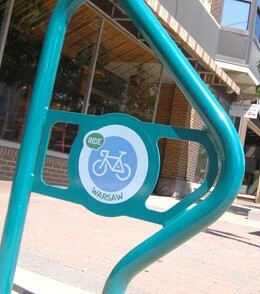 Whether in Warsaw or Winona Lake, Ride+Walk can facilitate the placement of approved bike racks at your business. Using a donation to purchase and install branded bike racks, we can help you to show your pride and support of biking. • Interested in having a bike rack in front of your business? Download our Request Form.